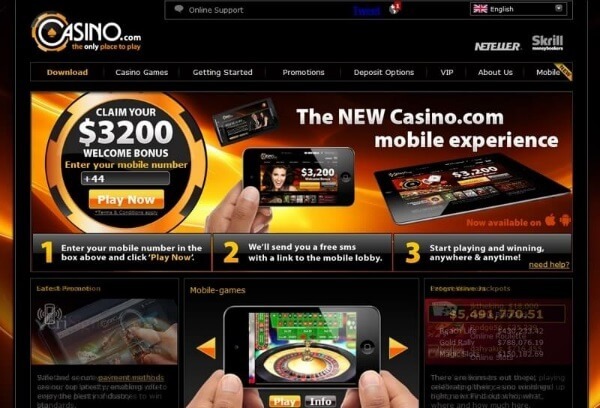 Casino.com is a website that belongs to the Mansion Limited Group, which has several other online gaming websites in their ownership. Each of the websites was carefully signed to suit players’ needs. As for this site, it has been around for years, and it has established a reputation as a trustworthy location for internet gaming. Two different gambling authorities issued a license to Casino.com Canada. One of them is the Gibraltar Gaming Commission, and the other is the UK Gambling Authority, which is both known by requiring the platforms to meet high standards to obtain licenses. Licensed: Licensed and regulated by the Gibraltar Gambling Commission and the United Kingdom Gambling Commission (UKGC). Games: Video slots, progressive jackpot slots, table games and live casino from Playtech. Slots – the foundation of all online games are undoubtedly slots. Although the website doesn’t offer a vast selection of machines like some other platforms, each piece of software is carefully chosen before it is added to the website. Table games – this category includes those options that require cards, such as baccarat, blackjack, poker, and others, as well as roulette, craps, and other options that are not based on cards. Live dealers – you can also take part in live streaming sessions with human dealers. Various games are supported, including several versions of blackjack, roulette, poker, and baccarat. Scratch cards – scratch your cards by moving your mouse or fingers across the touchscreen to see if you won. Arcade games – a selection of playing options that do not belong to any other category, including keno, Heads or Tails, and others. Casino.com is one of those platforms that offer a no deposit bonus. As soon as you register for a free account, you will receive 20 free spins for the selected slot machine. If you are a fan of slots, that will give you a nice opportunity to test how the website works. If you are looking for more serious bonuses, you should consider the Casino.com online welcome packages. When making the first deposit, the operator will offer up to $400 double up bonus. For example, if you add $100 to your account, the provider will grant another $100 as bonus money. On top of that, you will receive 180 free spins that you can use during the next nine days. For those who are fans of table games, the creators prepared a boost in the form of free golden chips to play at roulette tables. You need to make sure to enter the right Casino.com bonus code, and you will receive a bonus you can use on roulette or card games without the need to bet anything from your funds. We feel like we should mention that you should carefully read the terms and conditions of these promotions on the website. Pay special attention to wagering requirements to see how many times you need to play through the sum before you can withdraw it. You should always keep an eye out for available promotions on Casino.com, especially if you play regularly on this platform. An additional benefit of being loyal to the website is the loyalty program with reward points. The website offers a clear table that shows how to earn loyalty points. Depending on how many points you win, you can expect different incentives. As you collect points, you will also climb the rankings until you achieve the VIP Elite level. Based on your rank, you can qualify for a regular cash bonus. A great advantage of this online gaming operator is that it accepts PayPal. That is not often the case with internet gambling providers, but our Casino.com review confirmed that you could use PayPal to add funds to your account. As for other wallets, the website also supports Neteller, but it lacks an option to use Skrill. Apart from that, you can also use credit and debit cards, such as Visa, MasterCard, Maestro, and Visa Electron. Additionally, you can use Paysafecard, but please note that the method is not among the supported withdrawal options. If you plan to withdraw money from Casino.com, that will take a bit of effort on your side. The platform requires verifying your identity, which includes providing your photographic ID, as well as a proof of address. The system will also ask you to verify your credit card, but keep in mind that all this is because the creators try to protect the players from fraud. When it comes to how long it will take to withdraw, you will have to be patients for up to three business days after the approval. Keep in mind that a monthly limit exists and it depends on the currency you choose for playing and withdrawing funds. An online gaming operator is required to secure fair and transparent play on their website. However, there is also the issue of corporate responsibility. The provider we are reviewing promotes responsible gaming, and it even has a separate page dedicated to it. The platform allows you to choose gaming management tools, which will restrict your deposits on a daily or monthly basis. You can even choose to self-exclude yourself from the website for a particular time. You can also find a link to the website where you can ask for help in case you need it. Casino.com is not a perfect gaming provider, but it does plenty of things right. The crucial thing is that it deserves your trust because it has all the necessary licenses and permissions. The website also utilizes various encryptions to protect your data and funds. In terms of available games, there are some options that you won’t find on many other websites. The operator also accepts PayPal along with the credit cards, which is a huge plus. The platform could have a better selection of slots, but the tempting bonuses compensate for that. Feel free to visit the website today and see how it works for yourself.